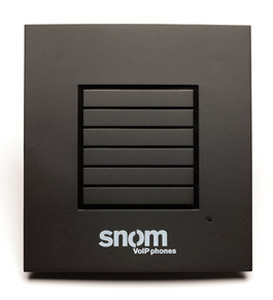 The snom DECT repeater is designed in accordance with the DECT standard. It is intended for a use in residential, business and public DECT applications based on the GAP profile. So they built an ideal addition to yoursnom m3. The snom DECT repeater has two internal antennas and can be used to double the effective range of a DECT Base Station. And the snom DECT repeater can ensure the seamless intercell handover from the base station area to the repeater area and vice versa.